I placed the fact cards around the school. I gave each group of 3 students one copy of the question sheets and a map of the school. I highlighted the areas where they would find the fact cards. 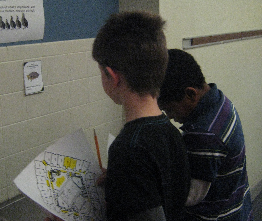 My students were released on their own to find 18 clues hidden in plain sight throughout the school...I Know!! They were amazing... quiet, respectful, collaborative, and excited! 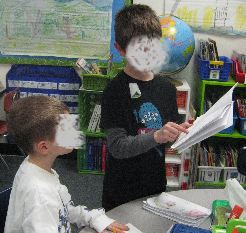 I loved walking around listening to the startegies they used to find the fact cards. I heard..."Okay, there is a yellow mark across from room 168. So we just find room 168 and look across the hall." and "This is room 145 and on the left of us is room 147 so room 158 is to the right." and "So, everytime we find a card we'll X out that spot on the map so we know where we have already been." Pretty good strategies for the first time they had to naviagate the school using a map. The reason this activity was such a success is because blended learning has helped my students learn how to collaborate and problem solve. 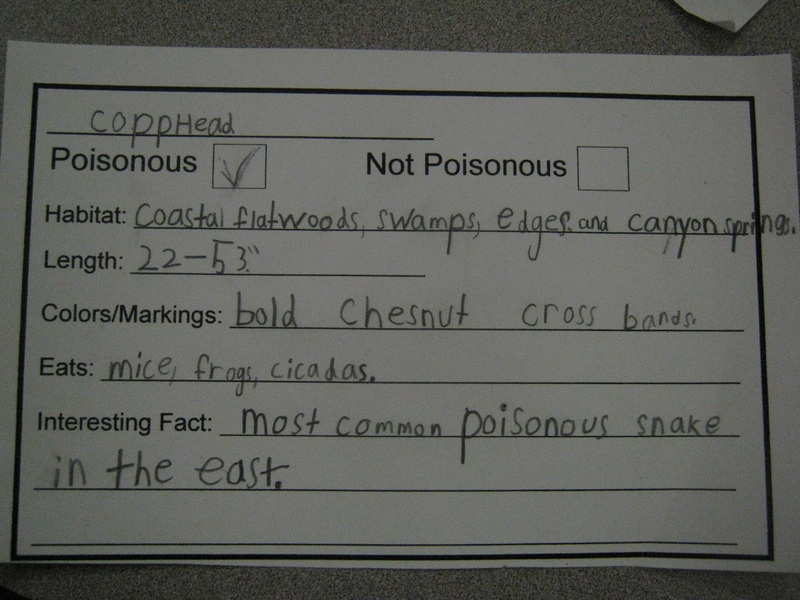 We have been studying Crocodilians. So I based a comparison project on the series Who Would Win? by Jerry Pallotta. This is a very popular series in my classroom. We read several books from the series and charted the types of pages and comparisons Jerry Pallotta wrote. Then students began creating their own books, Who Would Win? Alligators vs. Crocodiles. Some students need help skimming through the text on internet sites and pulling out the information they need. 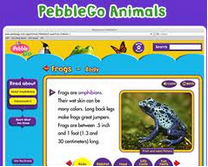 Some students need more structure in extracting information and so I suggest they use Pebble Go. Our school has a subscription. Of course, that meant research! As I move deeper into blended learning I realize that research needs to be blended as well. 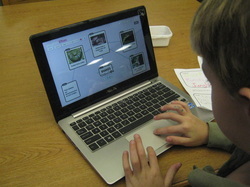 Some students are capable of 'googling' a topic, choosing a site and reading information on their own. (*Students must ALWAYS tell me when they are going to use Google so I can keep an eye on the information and images to which they are exposed). Some students are ready to use search engines but need instruction on how to choose the best words and phrases to search. Some students need support finding information in print resourses through indexes and the table of contents. Some students need instruction and support in taking and organizing notes from both print and digital resourses. After researching students decided on the types of pages they would create to make their case as to which animal would win in a battle. Some students were not comfortable having the alligator and crocodile battle so they made a case as to which animal was the most interesting. 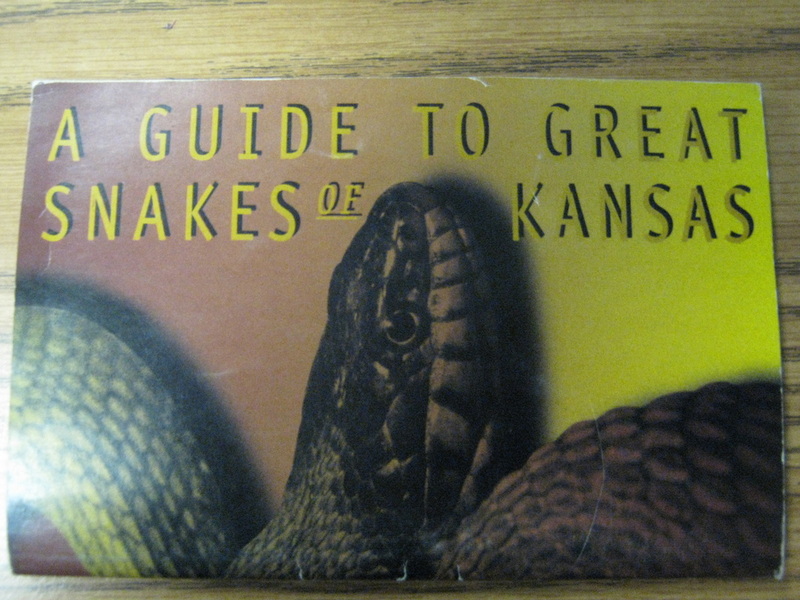 Each book included several pages of well written information before the final 'Who Would Win' page. 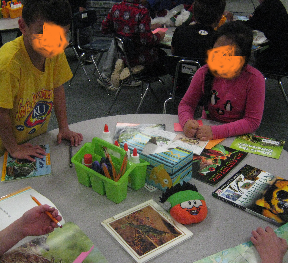 We then shared our books with kindergarten classes. My students were very serious and grown up in sharing these important books. Jerry Pallotta would be proud!!! 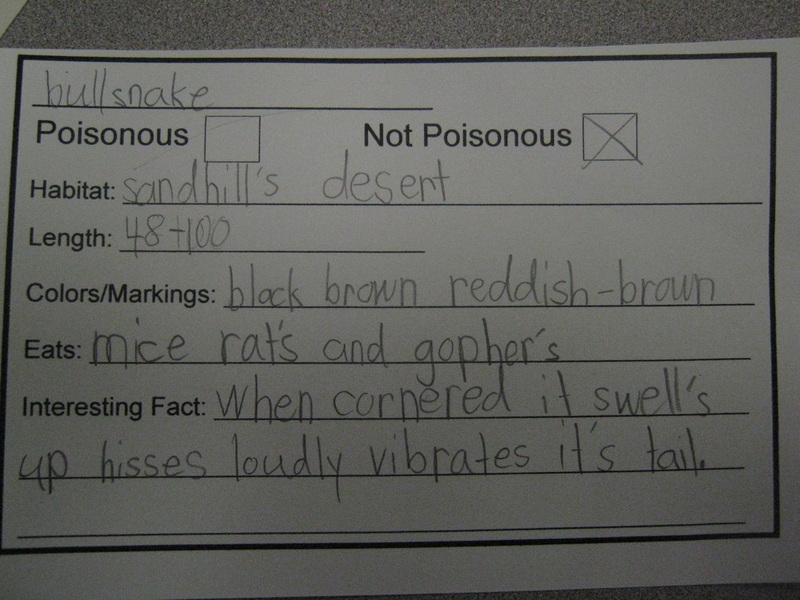 As part of our science unit on amphibians and reptiles students dove into snakes. Using pocket guides, books, and the internet they collected information to answer their questions. How do snakes move without legs? How have snakes adapted to survive their habitat? 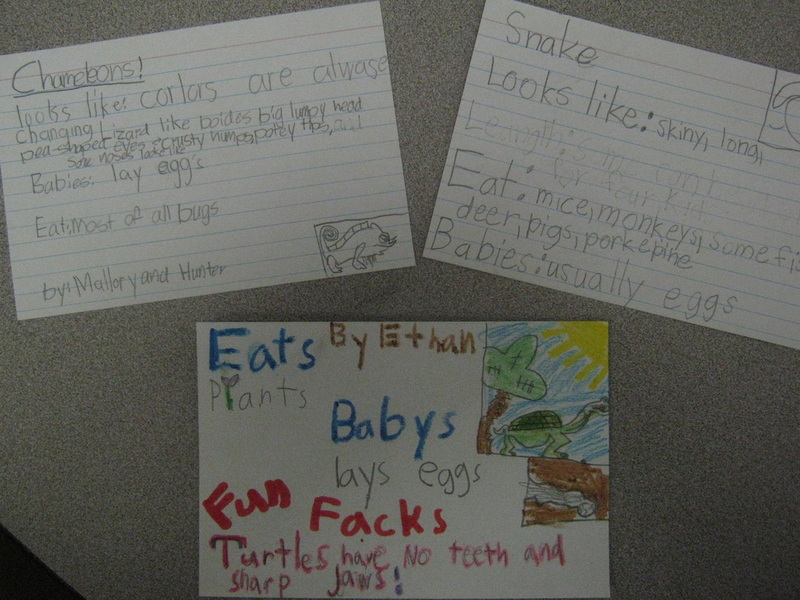 Students made fact cards and life sized snakes. 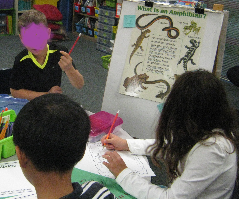 They worked to make their snakes realistic down to the last detail then presented snakes and information in small groups. Finally students used the APP Popplet to make a web developing the answers to our big question. As we become experts as various APPs and digital presentation options students will make their own choices about how to share their knowledge. But first... we have to become familiar with the various digital possibilities and become independent in their use. A month from now (or less) I envision students determining their own questions, working collaboratively to answer them, and designing their own mode of sharing their knowledge. I'm giving them the tools and confidence now to do that important work. Blending often means blending the lines of curriculum as well as the pace, the grouping and the instructional methods for students. A perfect example is our Frog Jumping Contest. First I read the story written by Mark Twain about the original frog jumping contest in 1848. Students folded their own origami frogs. We reviewed the actual rules of the Frog Jumping Contest and jockeys were ready! Jockeys designed and named their frogs. They set them on the lily pad and measured the total of three jumps. 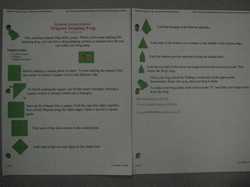 Students recorded three turns for each frog. Then they worked together to find the median jump. 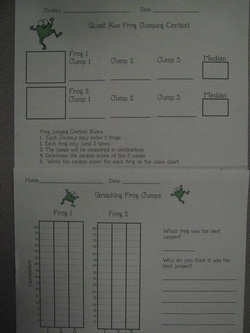 Students recorded jumps, found the median jump, and graphed results. 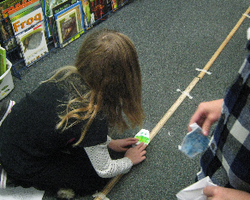 Students also worked together to find the median jump length for their group. 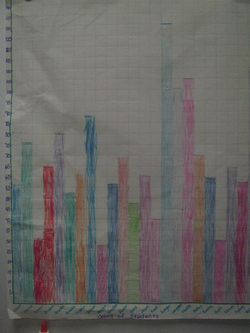 We finished up the activity by making a class graph of all the jumps. This data was used to work together to find the median, mode, and range. So much work but so much fun! A look at blending a morning of amphibians! 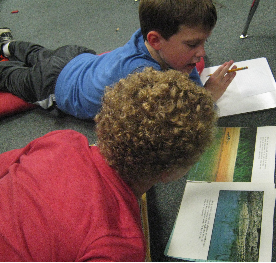 My goal was for students to be able to describe - explain - understand the following areas: habitat, predators, what they eat, life cycle, physical characteristics, and content specific vocabulary. I purchased and used pages from the Amphibian Scrapbook. I purchased this from teacherspayteachers. Stations were set up at each table in the room. Each station contained books and information posters. 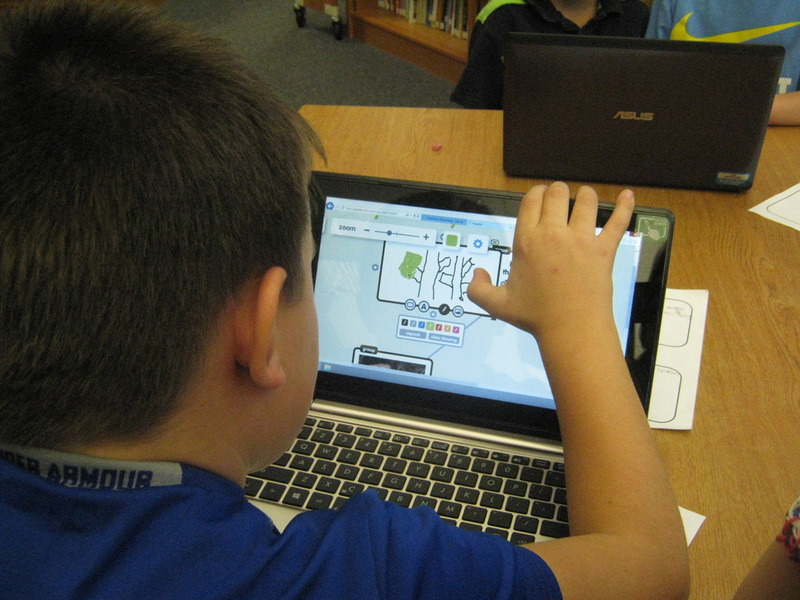 I had chosen internet resources and posted them on our class wiki so students could easily find information. Station topics were: habitat, preditors, lunch, vocabulary, life cycle, physical characteristics, types of amphibians, and favorite amphibian. 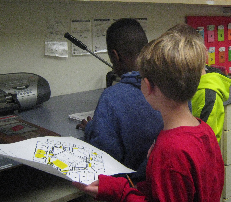 Students traveled through stations at their own pace. I am lucky enough to have a fabulous classroom volunteer. She is a retired librarian and so was perfect at the content vocabulary station showing students how to use the table of contents and the index to find information to define content vocabulary. We were all working so hard that when I thought to look at the clock an hour and 15 minutes had passed. I stopped the class and said, "Oh my gosh, does anyone need a restroom or drink break. I completely forgot to give you a break!" Some did take a break, the rest just went back to work. Today begins our 6 week study of Herps! Normally I would have launched the study by reading a book aloud while pointing out what herpetology is and charting the characteristics of amphibians and reptiles. It was probably more exciting than it sounds. So... how do I launch this study in a blended learning environment? I gathered a huge pile of nonfiction books about frogs, toads, salamanders, snakes, crocodiles, alligators, turtles, and lizards. The books and some plastic models were spread among our tables. I told the students that the books and models were clues and groups were to use the books and discussion to determine the definition of herpetology. 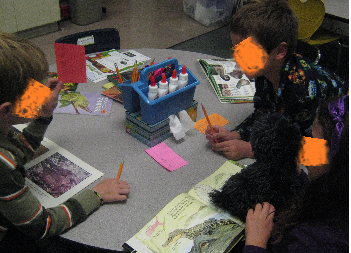 Then groups were given a sticky note and asked to write all the kinds of animals they deduced were herps based on the materials available to them. On the second sticky note students wrote physical characteristics they noticed the animals possessed. 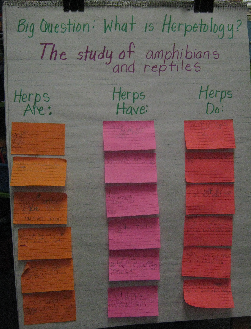 And, on the third sticky note students wrote what herps can do or how they move. The room got louder and pencils were smoking! 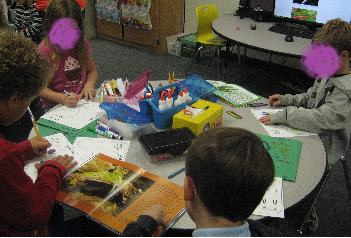 So rather than the teacher reading a book to 25 students... 25 students used multiple resources to discover for themselves the definition of herpetolory and to identify the characteristics of amphibians and reptiles. Added bonus... students really studied and talked about the photographs. 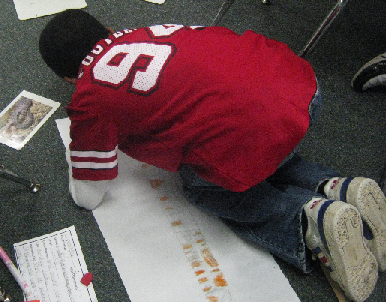 The first step was for students to learn what the body systems are and how they work. I checked out as many books as I could find on the human body systems at various readability levels. I also used the many scholastic books I owned. I purchased this set this year and it is a very good selection. I placed books on tables. Each table containg books on a different body system. Students made choices about which system to study, with whom and where to work, and chose print or digital resourses or both. 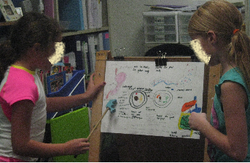 Their task was to learn about the body system they chose and be ready to teach the class about their system. Students took the job of teaching the class SO seriously. Their work was very detailed and their presentations well practiced. As part of CCSS speaking and listening anchors, students made a class chart before teaching listing good presentation behaviors. Following their lessons students self-evaluated based on the chart and set goals for their next presentation. 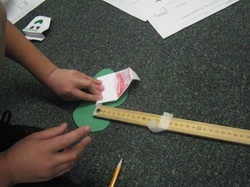 Using the Smart At Body Systems students made models of the body systems they researched. 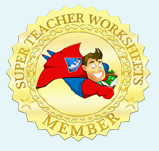 I am a teacher seasoned with 32 years of experience in first and second grade. I am excited to begin my journey with blended learning.